My first encounter with the US Immigration was in the summer of 1966. I was on my very first ship, a bulk carriers named “Har-Sinai” (Hebrew for “Mount Sinai”) as a deck cadet, we we have just arrived at Mobil Alabama, with 30,000 tons Iron Ore from Venezuela. As happens with every ship arriving at any port, US Customs and Immigration were the first to board the ship with the local ship-agent as soon as the ships is moored. The two US Immigration officers checked the Crew-List against their “Black Book”, a very thick book with black cover that contained thousands upon thousands of names of people who are not permitted to enter the USA. If your name is not on in the black book, the immigration officer would then look at your Seaman’s Book (equivalent to Passport), see that it is current, ensures that the photo in your Seaman’s Book , matches your face and hen he would consult his “Green Book” to see whether you have been in the USA before and if so, whether there are any marks against your name. Only when you pass such scrutiny the officer will stamp your pre-printed shore-leave pass which entitled you to go ashore, be legally in the USA, but only within an specified area only and only whilst your ship is in port. When all the shore-leave passes have been signed and stamped and after other customs and quarantine formalities are finalised the customs and immigration issue a clearance certificate for the ship, meaning stevedores (longshoremen) may come onboard, cargo work can commence, and crew may go ashore. The immigration officers would then leave the ship with all the seaman’s book and passports (if any) that will be returned to the ship just before the ships sails and after ensuring and everybody is actually back onboard. As this was my first time in the USA, I was finger-printed and photographed, just a standard procedure, I became another file number somewhere within the US immigration system. What about my “human right” I hear? Well, frankly it had never occurred to me; of course I could refuse, but it would have simply meant that I could not go ashore (and possibly raise some suspicion as to why I refuse to be figure-printed). But there was another snag; one of the other Israeli seaman onboard, let us call him Shlomo (I cannot recall his actual name), also a first timer in the USA, was declined a shore-leave pass, the reason was that the immigration officer discovered a person with an Israeli nationality by the same surname as Shlomo’s in the Black Book — It transpired that Shlomo’s brother had jumped ship some two years earlier, subsequently captured and deported. That was a sufficient reason to decline Shlomo’s a shore-leave pass. When Shlomo attempted to explain that he played no part in what his brother had done thus he should not be punished for it. The immigration officer explained that there is nothing in USA Law that says that he, the immigration officer, must grant shore-leave pass to anyone by right, shore-leave pass is purely a privilege, that he may grant or not and in fact he does not even required to have a reason for declining. Our ships-agent confirmed that there is no legal avenue by which the Immigration can be forced to grant a shore-leave pass. We are not US citizens, thus the protection of the Constitution of the USA does not apply to us (or words to that affect), It is the same way that any US Consulate anywhere in the world can, at least those days, decline entry visa into the USA at its sole discretion, he added. As harsh as it was, it made perfect sense to me. I also knew that the slightest breach of the condition of the shore-leave pass will result in my name being placed in the “Black Book”, with all that that entails. Shlomo was not allowed to leave the ship and indeed the Immigration turned up onboard a couple of times whilst we were in port to ensure that Shlomo is in fact onboard. 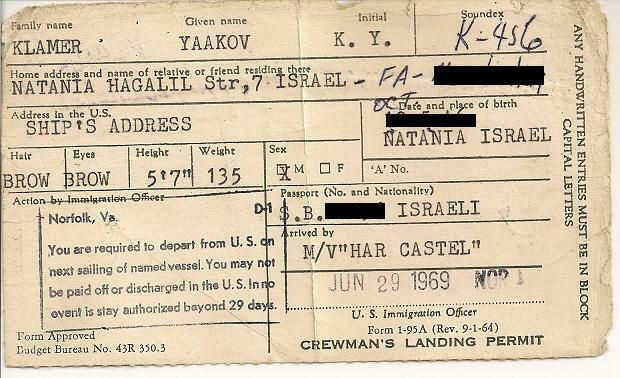 (I bumped into Shlomo a few years later in a street in Haifa and he told me that, after I left the ship and after a few subsequent calls of his ships in the USA, he was finally granted a shore leave pass because of his “good behaviour”, meaning he did not try to leave the ship without a shore-leave pass). Some two years later, I was already the Second Officer of another ship, a banana boat named “Har Bashan”. We were employed in the (Chiquita) bananas trades mostly from Central and South America to the US Gulf, US East Coast and Europe. The fact that I regularly call in US ports as an officer entitled me to permanent shore-leave pass which somewhat simplified the immigration procedures I had go through when my ship call in US ports. Carlos was one of the Able Seamen (AB) on the “Har Bashsan”; a Spaniard in his late thirties, a conscientious seaman and, by all accounts ,a dedicated family man. As the one who made the payslips onboard, I knew that Carlos withdrew just small amount of pocket money each (monthly) pay day whilst the balance of his wages was sent to his wife in Spain. Carlos did not speak a word in English but with my pigeon Spanish we manage to communicate. We spent long nights on the bridge in “palavra” (seamen’s small talk) when there was nothing else for us to do apart from watching the empty sea and sky. We talked about our respective homes, ships that we had sailed on, places we had been in and so on. I would not describe our relation as “friends” by any mean but there was a definitely a mutual affinity between us. On one of our call to the port of Baltimore, we have just completed discharging a ship-load of some 120,000 cartons of bananas and were getting ready to sail. Immigration were on board as usual, attempting to ensure that everybody is back onboard for sailing, a pure routine until we discovered that Carlos is not back onboard. If Carlos had jumped ship, he would not be the first or the last to do so, nor would he even be the first on this ship, but knowing Carlos as I did, I told the immigration officer, that as the officer who is the closest to Carlos than any other officer onboard, it is totally out of character for Carlos to jump ship, something must have happen to him I speculated. Using my Master Key, we entered Carlos’s cabin and inspected it; there were no signs that he had gone; in fact all signs pointed to the opposite. Carlos’s wife’s and kids’ photographs and a small Jesus on a cross icon were still next to his bed. His suitcase was there as what appeared to be all his cloths. By then I had inspected enough cabins of seamen who had jumped ship to know the signs and what to look for. There are a number of tell-tell signs, profile if you wish, of people who jump ships; they are usually professionally unqualified, they “travel light”, they joined the ship recently and they jump ships on the first opportunity. In many cases they also leave a large unpaid “slopchest” (the ship’s duty-free “shop” for the crew) account behind them. None of these tell-tell signs applied to Carlos. If anything, Carlos was the complete anti-thesis to a ship jumper. True, it is not an exact science nor is it a conclusive proof that Carlos did not “do the run” but it was certainly put a great dent in the probability that he did. The immigration office who accompanied me to Carlos’s Cabin seemed to agree with my conclusion, although he did not actually say so. The immigration officer then proceeded and called whomever he needed to call and after a while he informed us that all the checks with all the police stations and hospitals in the Baltimore areas turned out nothing, no Carlos! If Carlos had jumped ship he could never enter the USA again, that may also have severe implications of his ability get future works on other ships, Carlos had been at sea for long enough to realise the consequences of jumping ship, it simply made no sense. After a short consultation with the Captain, he agreed to put back the sailing time by one hour — so long as we remain alongside the wharf, Carlos cannot be declared an illegal alien, his shore-leave pass is still valid. We hoped that somehow Carlos would turn up within the hour. An hour turned into two, still no Carlos. The ship is now “off-hire” meaning the company that had hired the ship, United Fruit Company (UFC), is not paying hire for the ship itself, the fuel we are burning or the port charges we incur whilst waiting for Carlos – it is now all on our shipowner, our employer’s, account. We could wait no longer, not only we jeopardising UFC’ schedule, cost our owner money, but there was another ship waiting for our berth, meaning soon our owner would start paying the delay of that other ship too. Two and a half hours after the original departure time, our ship was cleared to sail after we had gone through the formalities declaring Carlos as “missing seaman on departure – reason: unknown”. Pilot and tugboats were ordered, lines (the ropes and wires that tie the ship to the wharf) were off and we were on our way. However, there was still one last chance, albeit a slim one; the geography of Baltimore is such that we still had about 12 hours steaming time down Chesapeake Bay ahead of us before we reach the open ocean, about 200 miles down the Bay, not far from Norfolk and Virginia Beach (Virginia). Before they left the ships we had advised the immigration officers, that on the off-chance that they find Carlos within the next 10-12 hours and he is medically fit to re-join the ship, we were prepared to stop the ship, wait at a rendezvous place in the Bay and pick him up. A few hours into our steaming down Chesapeake Bay, whilst I was on the bridge with the American Bay Pilot (who guided ships through the bay) and another seaman who took Carlos’s place at the wheel, The pilot suddenly turn to me and asked if we are missing a sailor. When I confirm that indeed we do and gave him Carlos’s full name, the pilot advised that the immigration have got Carlos and they wish to bring him onboard. I immediately called the captain who was not on the bridge at the time as this was beyond my authority to agree or otherwise. The captain came up to the bridge, gave his agreement and the pilot proceeded to arrange the rendezvous over his walky-talky. We change course in accordance with the pilot’s advice and headed toward the rendezvous point. Some 45 minutes later, the pilot pointed at a Customs Boat, amongst the endless number of small boats and yachts in the vicinity of our ship, that was heading in our direction and said: “Here is you man, on that boat”. 15 minutes later the customs boat was alongside us and we could see Carlos standing on its deck, clearly with a sheepish look on his face, he knew that all the binoculars on the bridge are focused on him. Carlos climbed the pilot ladder (a rope ladders usually used by pilots to get on and off ships) and got onto the ship’s deck. He immediately proceeded to the bridge where the captain and I were waiting for him. He appeared highly excited, obviously embarrassed, perhaps worried about the consequences of the “troubles” he had caused, talking… well, sort of talking; “Santa Maria”, “Jesus Christos” and some other unmentionable words were only ones I could decipher from his hundred miles per second Spanish. Eventually Carlos calmed down a bit and told us that he had gone ashore a few hours before we were due to sail to buy something in plenty of time to return to the ship before Sailing. Not speaking English, Carlos did what he had done “Un millon veces antes” (millions times before) in every non-Spanish speaking port that he had ever been; He would write down the name of the wharf where the ships was as he left the ship and when the time comes for him to back to the ship he would get a cab and give the taxi driver his piece of paper with the name of the wharf on it and let taxi bring him back to his ship. “Pero este taxista americano estupido” (But this stupid American taxi driver) in Carlos’s words, could not find the ship. After about two hours looking for the ship in all over Baltimore, Carlos realised that he was not going make it to the ship in time. He managed somehow to get the taxi driver to drop him at a police station where he found someone who spoke Spanish. “Por supuesto que tiene nombre” (Of course it has a name) Carlos objected, sounded slightly insulted that I doubt his word, “Hay una cartelera bien grande… justo afuera de las puertas de entrada… con el nombre… escrito en letras rojas…. es imposible de no verla… aqui, mirala por tu mismo!” (There is a big sign … just outside the gate … with a name .. red letters … you cannot possibly miss it … here, look for yourself! )” he said as handed me a piece of paper. I took one look at the paper and could not hold myself, I burst into an uncontrollable laughter; on the paper, in Carlos’s handwriting were two words: “No Smoking”. I have no idea why my Google Desktop brought up an article from 6th June, 1967 in my news tracking but it certainly brought up a blast from the past. It was one year to the day since I had completed my (compulsory) military service in the Israeli Navy. I was a young third officer on a merchant marine ship, named Har Bashan. Our usual employment was to carry Chiquita Bananas from Central and South America to the Gulf (of Mexico) ports, the US East Coast and to Europe. 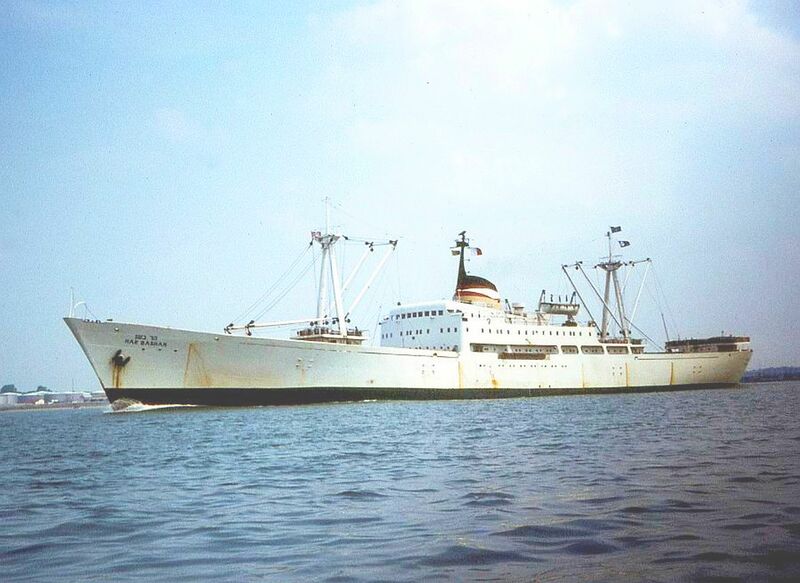 On the day, 6th June, 1967, we were in a “port” named Turbo in the Gulf Of Darien in Colombia (I dare you to find it on the map) which was in fact an anchorage, about 2 miles away from shore, where ships were loaded bananas from barges. You have to bear in mind prior to the Six Days War, Israel was not perceived as a militarily strong country, that war in fact changed the perception about Israel for ever. Nor had Israel particularly strong relations with the United States at the time who had more then their own share in Vietnam. Israel’s main supplier of arms were France and Britain (in this order) for which Israel paid in hard cash whilst the Soviets armed Egypt and Syria to the teeth mostly by grants and on the never never “loans”. For the previous two weeks we were getting worrying news from home about the pending invasion of Israel by Egypt and Syria. Nasser’s grandstanding about the forthcoming elimination of the Zionist state and the return of the Arab refugees to their homes – the term Palestinians in the context of Arab refugees was not invented yet – the United Nation was quite, there was neither calls for “restraint” nor was anyone was labelled as “the aggressor”, just silence. Despite the fact that the ship flew the Israeli flag, I was the only Israeli officer onboard, all other Israeli nationals were “ratings” (non ranking officers crew members) and there were not many of them either. The captain and Radio Operator (sparky) were Italians, the Chief Officer was Norwegian, the second Officer was Dutch, a (semi deaf) Irish Electrician and down in the Engine Room they were Spaniards, Italians and the odd Yugoslavian – a tower of Babylon. Perhaps my position on the ship symbolised the state of Israel those days, near TOTAL ISOLATION. For the preceding ten or eleven days we had crossed the Atlantic Ocean on our way to Turbo. The only sources of news we had were the short waves services of the BBC and the Voice Of America (VOA). Kol Israel (Israel radio) in Jerusalem was out of range since we entered the tropics as it’s relative low output could not penetrate the atmospheric noise typical to that part of the world (the fact that Kol Israel beams its signal towards Europe and North America made compound the difficulty). Unfortunately the shop’s Italian Radio Officer (sparky) showed little interest in getting the Israeli national on board, the daily news bulletins from our home maritime shore station Haifa Radio. The little news we got was not good, to put it mildly. The UN Peace Keeping forces in the Sinai Peninsula folded up and went hone at the first “request” by the ruler of Egypt, Colonel Gamal Abdul Nasser, leaving the Egyptian army a clear path to the border with Israel. I Israel there was a full and general call up of all the military reserves (all men till the age of 45 and beyond), the civil defence and volunteers literally dug up the country with trenches and shelters in schools yards, near residential buildings, in parks and around towns, villages and the kibbutzim. The mood in Israel was sober indeed, every Israeli “knew” that this was going to be a bloody war with many civilian casualties, some went as far as doubt Israel ability to withstand a coordinated attack by Egypt and Syria, with a possibility of Jordan joining in, and a massive support they received from the Soviet Union, that may, it was thought, extend to sending their own troops to assist. A second Holocaust in 22 years was a distinct possibility in many people’s minds. The tones of the BBC and the VOA progressively resembled obituary rather then news reporting. Its resonated as “oh well the experiment of a Jewish state was a good idea at the time, but”, of course no one said it out right out in that many words, or did they? About a day or so before we arrived to Turbo, my immediate superior the Norwegian Chief Officer “declared”, with some satisfaction as I recall it, that there will be no Israel within a few days and added Israel is finished, kaput. Whilst I am not a betting man, I was willing to bet him that he was wrong and he took the bet. Until this day I don’t know whether it was my patriotism or my belief in Israel’s strong will to survive that made be bet. I was far from certain of collecting on the bet and not because I thought that should I win the Chief will not pay up. We arrive at Turbo in early morning hours of 5th June, the day the war erupted. Because of a 7 hours time difference with Israel, we already knew that the war had started but no more then that. The BBC reported that the IDF (the Israeli Army) spokesman confirm that “there are military clashes in the south” (or words to that effect) and that there was a complete blackout on news from the front. From the other side of the border, the Egyptian media reported that their forces reached a point two hours away from Tel Aviv. We knew not whether there are Soviet troops on the ground and/or Soviet pilot up in the air. There was nothing coming from the United Nation or any of the then four “Great Powers”, USA, USSR, UK and France. Despite the lousy reception I had my short wave radio tuned to Kol Israel in Jerusalem just in case I decipher some useful news in the myriad atmospheric noises of the tropics and more important to confirm to myself that they, in Jerusalem, are still transmitting, a scary thought indeed. I also asked the sparky if he can still get 4XO (Haifa Radio) which he confirmed. Not much comfort but some hope, I thought. The following day, 6th June, I suddenly heard it on the BBC from their man in Jerusalem, the report was much like to the Guardian story quoted below, down here. My initial reaction was a total disbelief, I truly thought and said it out loud that if Israel needs to revert to such exaggerations as the Arabs do, we are gone! it was a frightening few hours indeed. President Johnson last night condemned the war as “needless and destructive” and gave first priority to trying to end it through the United Nations Security Council. Yes! We are in business again. Had it erupted today under similar circumstances, instead of needless and destructive the six days would have probably be worded as disproportionate or inordinate use of force or such UN politically correct Newspeak. AS a side comment, it is interesting to note that there is no mention of the term Palestinians in the Guardian article below. The reason is simply that in 1967 the Arab refugees were just that Arabs, they became Palestinians with the raise of the Palestinian terror, but this is a whole separate subject. This article appeared in the Guardian on Tuesday June 06 1967 . It was last updated at 15:17 on January 06 2006. Israel claimed early today than it had achieved victory in the air by destroying 374 Arab aircraft. It also claimed that Israeli ground forces had captured the towns of Rafah astride the main road from the Gaza strip to the Suez canal and El Arish, farther west. A tank battle involving more armour that was used at Alamein was reported to be in progress between Israel and Egypt in the Sinai desert. After a day of confused reports this sector and the Gaza strip, in which Israel claimed to have made important advances, were emerging as key areas in the war. Attempts were being made at the United Nations last night to sponsor a Security Council resolution agreeable to the four big Powers calling for a ceasefire, but the Soviet delegate said he had heard of no agreement. In Moscow the Soviet Government condemned Israel for an act of aggression and demanded that it should immediately and unconditionally stop all military action. Tass reported that the Soviet Government “reserves the right to take all the steps that may be necessitated by the situation” and resolutely supported the Arab Governments and peoples. The American State Department declared US neutrality “in thought, word, and deed”; Mr Brown told the House of Commons that Britain’s concern was not to take sides but to restore peace to the area; and the French Government announced the suspension of arms shipments to the Middle East, where Israel is its main customer. The American statement of neutrality aroused controversy in Washington where the White House denied that it meant the US did not care what happened. The scale of the fighting outside Sinai is not yet known. Official Israeli statements said the attack had been launched by the Arabs in the divided city of Jerusalem, and along the Syrian frontier near Dagania. Israel also claimed that Syrian aircraft had attacked the Haifa Bay region and the Megiddo had been bombed by Jordanians. In the battle for control of the air Israel claimed to have destroyed 302 Egyptian, 20 Jordanian, and 52 Syrian aircraft. Egypt said that 70 Israeli aircraft had been destroyed during attacks on airfields in Cairo and in the Suez Canal zone while Damascus Radio claimed 54 Israeli aircraft shot down over Syria. Each side claims that the other struck first. Israel alleges that the first onslaught came from Egyptian tanks and planes in the Negev early yesterday. Cairo claims that the fighting started when Israeli aircraft raided Cairo and other parts of Egypt at 9 o’clock local time. The Arab oil-producing countries meeting in Baghdad unanimously decided to stop the flow of oil to any country taking part in an attack on any Arab State or its territorial waters. President Johnson last night condemned the war as “needless and destructive” and gave first priority to trying to end it through the United Nations Security Council. For the time being it appeared that the United States would not intervene directly to try to halt the fighting. At an emergency session of the Security Council which adjourned after 50 minutes, U Thant, the United Nations Secretary-General, reported that UN Emergency Force (UNEF) units in the Gaza had been fired on by Israeli planes and three Indian soldiers killed. Powered by WordPress v 3.5.2. Page in 0.259 seconds.